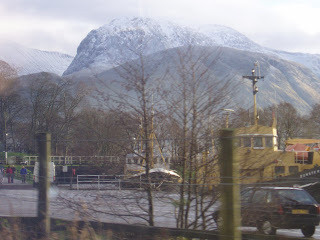 We also spent a few days exploring the Scottish Highlands around Fort William and Mallaig and stayed in a lovely Bed & Breakfast called "Glenlochie" at the foot of the mighty Ben Nevis. The snow at the top of the Scottish mountains was the only snow I saw the entire time we were away and it was so far away that it looked more like icing sugar on a huge cake. I've wanted to visit Scotland ever since I was a little kid and was egged on by my grandmother whose father was Scottish. Grandma instilled a great Scottish pride in me but sadly she never actually visited Scotland herself....how she would have loved the place! Much to my family's amusement, I played the side-drum in the Perth Ladies Highland Pipeband from when I was twelve until I was fifteen years old and my favourite Scottish singer is Kenneth MacKeller. The Best Library Bag Ever! !